If apps were made up of romantic comedy cliches, Mahjong Elements would be the geeky girl next door who becomes a knockout when she takes off her glasses. I’ll admit, mahjong solitaire will never be the sexiest of games, but Mahjong Elements for the iPhone and iPod Touch does a halfway decent job of making it seem that way, but don’t worry; it’s nothing scandalous. Developer FDG Entertainment has just taken the same old boring game and updated it with smashing visuals, a generous double helping of layouts, and a nifty keen upgrades system. 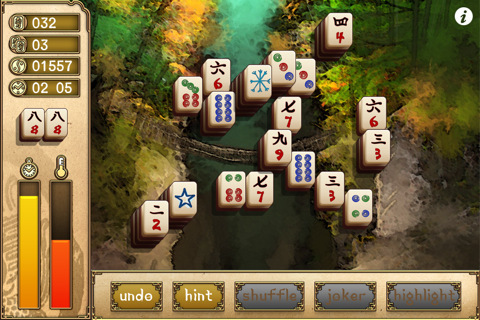 It’s still solitare mahjong, but it’s gotten a major facelift. I admit, it’s a mahjong game, so you can’t expect too much from the graphics, but I was pleasantly surprised. All the backgrounds are done up in an attractive Asian-esque style, all with an appropriately elemental theme. The visuals aren’t super-crisp, but it’s still a very pretty looking game, and the music isn’t all that bad either. With 200 different levels to choose from, there’s more than enough content to keep you busy for a good long while. All the levels are themed and come in a variety of unusual layouts that I’ve never really seen before. Sometimes this is good, other times it’s highly frustrating, but it’s usually a fun challenge. There are extra bonuses for finding matches quickly and a special “fever-meter” to really help you rack up the points. There is also a collapsible HUD that helps you keep all of the extra buttons and information out of the way so you can see the screen, but still lets you get to it easily. Unfortunately, levels aren’t really sectioned out by difficulty, which can make it hard to find the right level if you’re feeling lazy or pressed for time, but the game comes with an interesting upgrade system that rewards you for frequent playing. Unlike most mahjong games that give you all kinds of hints and undo buttons upfront, Mahjong Elements makes you work for it. As you complete levels, you earn coins which you can spend in the game shop. The shop lets you purchase various upgrades like hints and undo moves, but it also lets you buy things like fresh background music to keep things from getting stale. You can also purchase one time use Jokers to skip levels entirely. While the shop offerings aren’t particularly imaginative, the whole concept makes the game a little more fun by offering you concrete goals. Adding to the fun are a number of trophies to earn, as well as full Game Center integration, so you can compare stats with friends and strangers alike. All in all, I really enjoyed Mahjong Elements. It didn’t blow me away with ingenuity, but it took a familiar game type and made it sparkle. Mahjong fans will love this one and everyone else will think it’s a very solid rendition of a predictable, but still well-loved game. 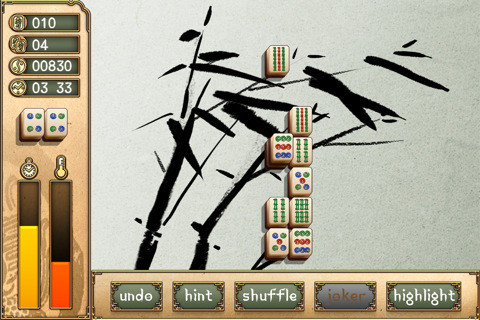 AppSafari review of Mahjong Elements was written by Tracy Yonemoto on June 9th, 2011 and categorized under App Store, Board, Featured, Games, Puzzler. Page viewed 4299 times, 1 so far today. Need help on using these apps? Please read the Help Page.